To find out more about SAL click here. 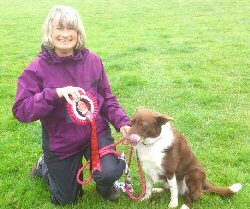 My favourite agility run... was at North Derbyshire June 2013 when I won Grade 6 Agility. I never, never thought I would reach Grade 6 let alone win once! I don't like... getting my motorhome stuck in the mud at competitions. My greatest... day was when Ted came into my life. The last time... I had a holiday was years ago. The dogs come first. If I could... I would like to listen to Ted talk and know what he thinks. Is he happy, warm, does he have any pain etc? My advice is... Enjoy your dog and agility, but remember they are our pets before agility; they are not machines. My favourite... dog is a collie. I have five of them. I don't like... people blaming their dog. My greatest moment... was holding our wedding reception at the Dogs in Need Show. I remember... when it was usual for a show to only have one or two rings. The last time... I went on holiday was about 25 years ago - before I started agility. All my holidays are spent at shows now. If I could... afford it, I would have my own indoor arena for training. My advice is... to enjoy doing agility with your dog. My favourite... day is Saturday. My greatest wish... is to grow wings on my feet. The last time... I rode a bike I was a child. If I could... I would live on chocolate. My advice is... enjoy your hobby but not to the detriment of your dog's happiness. My favourite... colour is pink. I don't like... winter weather. My greatest... love is walking on warm breezy days in Spring or Autumn where you can see for miles. 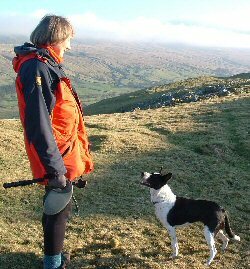 I remember... the course and the judge when I won out of Starters with my first agility dog - a Border Collie - 10 years ago at Dogs in Need 2003. The last time... I ate pistachio nut ice cream was in the hot sun in Gran Canaria 2004. If I could... I would sell ice cream on a warm sunny beach for a living. My advice is... Don't spoil today worrying about yesterday or tomorrow. 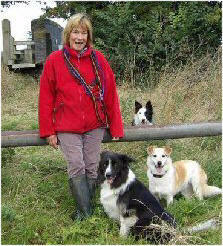 My favourite... pastime is doing something with my four dogs which was one of the reasons I started doing agility. I don't like... foreign holidays, foreign food and, as everyone who knows me well, not a lot of our food either! (veg. pasta, nuts ) just to name but a few. My greatest achievement is... not eating a whole chocolate orange all at once. I remember... very few things nowadays as anyone of my age will agree. If I could... I would run faster. I would then maybe manage to win my grade. I am keeping Jude back. 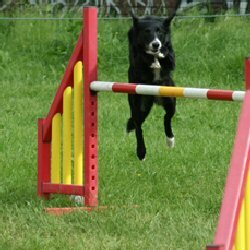 My favourite... Agility moment was the day in August 2013 at the Hare 'n' Hounds show when Holly's four top 10 places from four clear rounds took her past the 800 points needed to qualify for the Agility Warrant Gold. I was (still am) so proud of her. I don't like... the fact that Holly has been lumbered with an increasingly creaky handler due to my dodgy joints. In a weird way though, my problem has strengthened our bond, because I'm having to trust her ability to work away from me more and more. 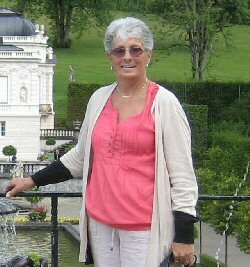 My greatest... debt of gratitude must go the the agility trainers at Wigton Club for all their help and encouragement over the years. 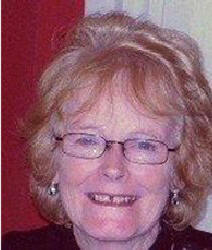 Special thanks to Jackie Reid who has done so much to improve my distance handling. I remember... that when I started out in agility I was an Elementary handler, the Large Dog jump height was 30 inches and the price of petrol wasn't a major consideration when travelling to shows. The last time... I compete in agility will be a sad day. I just hope I can carry on long enough for Holly and me to retire as Veterans together. If I could... be granted one Agility wish in 2014, it would be for us to win out of Grade 3. My advice is... never believe that an old handler can't be taught new tricks. In fact, I've found that learning new handling methods helps to keep my brain cells working. My favourite... music is from the 60s. I don't like... getting up early, especially in winter. My greatest achievement... was giving up full-time work at 50 and being able to please myself. I remember... being able to remember the courses easily. Now it is more difficult. If I could... I would be 20 again I would run a lot faster. My advice... Is to enjoy every day as we don't know how long we are here. My favourite... holiday would be a cottage in the UK, near rivers and waterfalls or the sea, very few people and lots of dog walks in beautiful countryside. I don't like... cities despite the fact I grew up in London. Give me the countryside any day. My greatest decision... was to get a dog when I was 50. My husband really didn't want me to get get one so it was a hard decision to make, but it changed my life. I remember... when I collected up my first rescue dog at South Mimms Service Station. He slipped his harness just before they passed him over to me and was racing around the car park by the M25. I was terrified he would get run over, but we managed to catch him, eventually! The last time... I fostered a dog for Hope Rescue I adopted her. 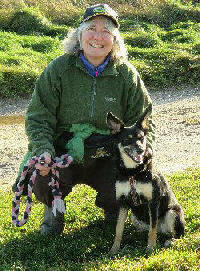 That was Mindy, my Kelpie X. 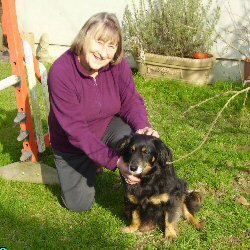 She's a nervous girl, frightened of other dogs and lots of other things but so affectionate. If I could... live my life again, I would get a dog sooner and start agility when I was much younger. My advice is... when you are looking for your next dog, choose a rescue dog. There are so many amazing dogs out their waiting for a place to call home. I use the 'E' in my name as there are two Janice Harris's doing Agility. We are great friends and have a lot of fun causing confusion with our names at shows. My favourite ... breed obviously is the Beagle, I currently have three. However and have just acquired a puppy Beagle x Collie. Watch this space! I don't like... to see dogs being roughly handled at agility shows when normally it is not their fault that something has gone wrong. Dogs are always trying to please, but they could misread the signals if not given clearly enough. My greatest moment... was when Team Beagle took to the ring and we came 2nd. It was absolutely fantastic. They are becoming more popular in agility now, and it is nice to see. 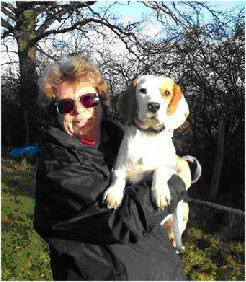 I remember... when I first qualified for a KC Beginners Final with my first Beagle Zak. It was pouring with rain and a real yucky day, but what a feeling when you step out into the ring with all those people watching. We didn't get placed but what an awesome experience. I have been in other finals, but you never forget your first time. The last time... 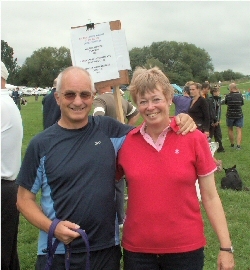 I had a really enjoyable time at an agility show was Dogs in Need 2013 in Beagle Bunch Corner. If I could... I would love to get Perth to Grade 7. We have gone from Grade 4 at the beginning of 2013 to Grade 6 at the end of the year. I know she is well capable - it's just the handler! It is nice when other people ask if they could run her. Not many people want to run Beagles because you never know what they are going to do. My advice... to anyone wanting to own a Beagle is to really research the breed. They can be very stubborn and quite destructive, but they have an absolutely brilliant temperament. As with most dogs, when you put in the work you will reap the rewards, you just have to work a bit harder with Beagles. 'My favourite... escape route is: Via the front gate. I don't like... tt when the Beagle Bunch catch me escaping. My greatest defeat... against the fencing was when I got caught two caravans away. I remember... the days of no Beagle Bunchers catching me as I escaped. The last time... I escaped I only got as far as the car. Age: 3 years My favourite... thing is being on holiday in our motorhome with my husband and dogs, off on a day walk somewhere with nice views/scenery where the dogs can run and play with some sunshine thrown in for good measure! Having retired early and only recently, this is something we are doing more of. I don't like... rain, especially if it is windy as well. My greatest achievement is... winning the KC Starters Cup at Discover Dogs with Poppy, despite me running with a torn calf muscle. I remember... thinking I would never win out of Grade 1 Agility. After 12 years of doing agility, along came Poppy who is turbo charged. 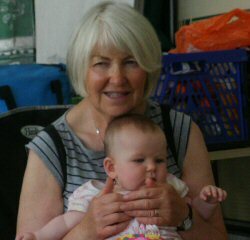 She is proving that with her, I can do a lot more than I realised. The last time... I competed I was in agony with my leg. I am hoping that several months rest will have cured the problem, and I will be able to run again. Otherwise it will all have to be done with distance control! If I could... 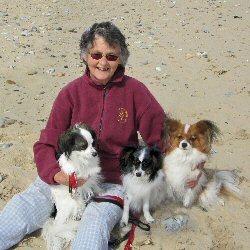 I would set up an indoor training school/arena for agility, obedience, flyball and other dog activities, with daytime and evening classes, competitions, a cafe, seating areas, heating, and nice clean loos! My advice is... Buy a lottery ticket as it will be the only chance you can achieve a dream of your own indoor arena with all mod cons! Age: 5 years My favourite... breed is the Border Collie and I have two. Will (G5) was my first agility dog and is the nicest dog anyone could have. I also have a two year old Grade 3 called Reo who is a darling but bonkers! I don't like... people who get angry with their dogs when they go wrong. This is a fun sport and should be for the enjoyment of the dogs not just the humans. My greatest... thrill was winning the Laser Pairs Final last year with my Pippin and Amanda Hampson with Rogue. I think we were the only Medium pair to have ever won this. It was soooo exciting! I remember... the first time I ever competed at Agility. It was at Agility Addicts with Will and we were appalling. I think we were eliminated in everything! I nearly gave up on the spot. I felt such a fool but I'm really glad that I didn't. If I could... I would turn back the clock and would have started doing Agility when I was much younger when I could run faster and remember the complicated courses. 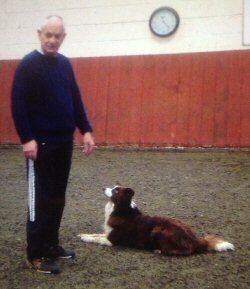 I did start training with a previous Collie, but he developed epilepsy and the vet said Agility could be too exciting and so I took his advice and that was that. I know now that quite a few epileptic dogs compete and, if I had my time over, I would probably have carried on. My advice is... to enjoy the sport, enjoy your dogs, make lots of friends and have fun! 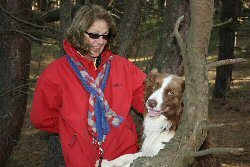 My favourite... dog is Buddy, my first agility dog. He was about one year old when I rehomed him from Morgans Rescue, hence the MorgansR in his name. We've made huge progress from a very timid start. Agility has helped build his confidence and I know there is more to come. Thanks Wigton DTC! I don't like... aggressive dog handling. 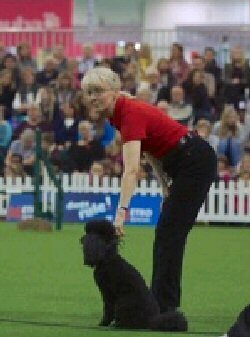 My greatest... relaxation is spending time at shows with our dogs and agility people. I remember... when Buddy was scared of everything. Now he's a bit more selective! The last time... I forgot a course was... ah... quite recently. If I could... I would clone Buddy whom I love to bits. I'd make sure he was just as beautiful, but with a full-sized brain! My advice is... remember that agility is fun, so relax and enjoy! My favourite place... for a holiday is by the sea as my dogs just love it. 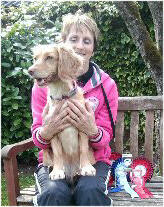 My greatest achievement... with Daisy so far Is being part of a Medium Team which has qualified for Crufts this year. I remember... the day we went to collect Daisy from the Blue Cross. She only had eyes for the ball I was throwing. I had no idea that agility with her would take over my life! My advice is... keep fit to keep up with your dog. My favourite... past time is being out on our canal boat 'Sarah' with Geoff and our dogs, and they love it, too. I don't like... having to go out to work. I much prefer to work from home or not at all - it just gets in the way. My greatest... mishap was falling into the canal lock in freezing weather in a very dirty section of canal! I remember... Mollie, my first agility Cocker Spaniel, taking part in an agility display at Shrewsbury Flower Show with hundreds of people watching. She ran a hooley - playing to the crowds. They had so much fun at my expense. The last time... I went to Japan the snow was so deep that the street lamp posts were buried and paths were cut out by people with shovels. No one complained about 10 feet of snow - life just carried on. If I could... I would have taken more chances with Amy's agility and not limited her chances by holding back, thinking we were not good enough. My advice is... Live for today. Tomorrow will look after itself. Life is too short, so enjoy being part of it and don't limit yourself. Believe in yourself. Age: 6 1/2 years My favourite thing about agility is: The new friends I have made. I don't like... Competing in high winds and rain. My greatest decision: Apart from marrying my husband, was getting Scruffy from Hope Rescue. I remember... Watching people walking agility courses and wondering what they were doing with all their arm movements - now I know. If I could... I would go back 25 years and take up agility sooner so my brain could react quicker when mistakes are made. My advice is... Agility should be fun so enjoy your dog. My favourite thing is... agility. 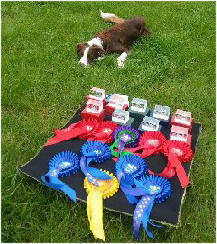 My greatest achievement last year... was winning Welsh Handler of the Year Agility. If only... I could have done as well in the jumping section!! I remember starting Agility about 25 years ago and all the wonderful dogs I have had in that time. I now have Belle's brother and two more WSDs plus a young Kelpie. My advice is... Keep smiling, Agility is fun. Age: 3 years My favourite... food is traditional British food. I just like good 'simply' cooked food, i.e. roasts, shepherds pie, hot pots. No garlic, hot spices, Indian/Chinese etc. I don't like... when vehicles parked on pavements. Pavements are for people who are walking/push chairs/wheelchairs etc. Why should we have to walk in the road in order to avoid them! My greatest... agility achievement is getting my older Sheltie Archie to Grade 7 between 2008/2011, something I never even dreamt of. 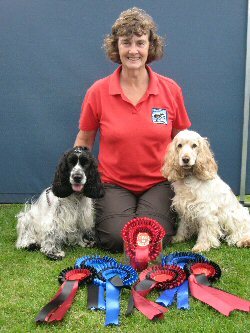 I had competed for about 10 years with my other three dogs, and apart from enjoying ourselves, only ever gained one 1st place with a fluke Agility win - we were the only dog clear, just 0.01 seconds within time. I remember... going to the corner shop in the late 1940s/early 1950s and being amazed at the shop keeper's skill at using the wooden butter 'paddles' to create a half pound block of butter. It's something that we don't even think about these days when we just go to the supermarket and pick it up off the shelves. The last time... I went out in the caravan it was wet, very wet. It was at Dog Vegas in October. On the last day, I decided that it was just too wet to risk injuries to both myself and my dogs, so I went home early. I had, however, been lucky enough to have gained a 1st, 2nd and 3rd place earlier in the weekend. If I could... I would have younger legs. The younger competitors in our sport make it look so effortless, while I sometimes feel that I am running in a bog. 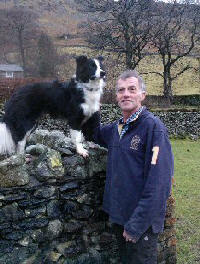 Having said that, we have some fantastic young handlers out there, so good luck to them in the future. My advice is... just go out and enjoy having fun with your dogs. We all take the best dogs home whatever they may or may not have done,. Just enjoy them for what they are, pets first and foremost. Anything else is just a wonderful bonus. I don't like... very little! Probably badly behaved dogs and ignorant owners. My current love is Dib, the saint of the dog world and winner of Small Diamond! I remember... being a refugee in Australia during World War II. The last time... 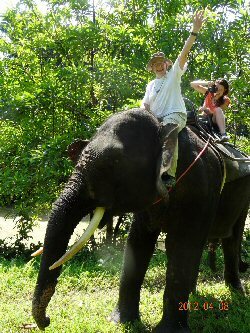 I rode a mule in the Brazilian jungle, everyone else trekking got wet and muddy but I had the best day ever. If I could... I would go white water rafting! My advice is... life is for living, so do just that, and keep running with your dog. Agility is aerobic exercise! Keeps you fit and young! I don't like... rainy days. 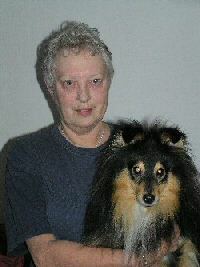 My greatest achievement is... the thrill was winning Grade 4 Agility with Misti. I remember... my first agility competition as fun. If I could... I would have another dog just like Misti - life would be perfect. My advice is... Never give up. Breed: Patterdale Terrier Age: 4 years My favourite hobby... other than doing agility, is doing handicrafts. 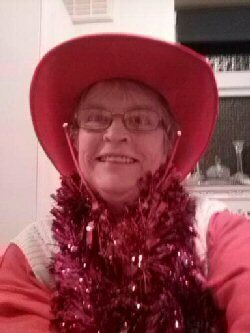 I particularly like knitting, crocheting and card making. You will usually see me travelling to the agility shows with my knitting on the go. Arthur does the driving! I don't like... housework, wastage or throwing things out. 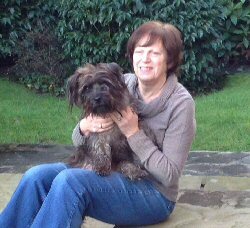 My greatest achievement... other than raising two great children who have gone on to give us five lovely granddaughters, is to have got both my Collie and Patterdale to Grade 7 despite my being of mature years. I remember... the times that our various pups have run off with my balls of wool - the little blighters. The last time... I filled out anything like this was when my Collie, She's Little Acer, won the Agility Club's Starter of the Year category. If I could... 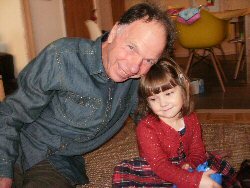 I would run faster as I know I would get far better results with Tilly, but it's no good saying 'if only I was younger I could do so and so.' Even at school, I never liked athletics or cross country as I couldn't run. My advice is... to believe in yourself, take up the challenge, and go for it. My favourite thing is... taking all my dogs for walks in the countryside. I don't like... those people who cannot control their dogs while out walking. My greatest achievement in agility... After owning five large dogs over the years has been getting my latest dog to Grade 4. I remember... when I started agility in the 1980, and how it has changed since then to now. The last time... I won with my Penny, she got me to Grade 6. If I could... I would love to get Penny back her confidence in completing the seesaw at shows. My advice is... to enjoy running with your dog and never give up trying. Breed: Papillon (oversize!) Age: 8 years in April I don't like... early morning starts. In fact, more and more I really hate them! My greatest joy... Is running Skipper. He is so tuned in to me, and, for the duration of his round, I feel young again. Thirty-odd seconds of this feeling is worth all the agony! I remember... the days when we first realised we'd got to handle - and especially weave - on the right. I felt spastic. If I could... I would turn the clock back about 20 years, but keep the knowledge I have now! My advice is... as you get older, forget about the points, the targets, and the trophies, and just enjoy. 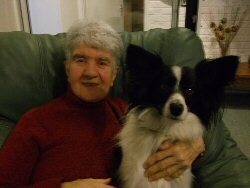 At 75, I think I am just grateful to have stayed upright, and still be having fun with a wonderful dog who loves me. Breed: Crossbreed Age: 9 years I can't remember... too much I think. I am 82 and that makes me more prouder for us to come this far. My favourite thing is... training my dog. I don't like... to see harsh handling. My greatest regret is... not getting into Agility years ago. I remember... seeing my first dog (a Golden Retriever) on top of the A-frame, sniffing the air, jumping off and running out the ring to steal a bread roll from a refreshment table. The last time... I felt stupid was when I fell over the tunnel and landed on my dog! If I could... I would turn turn the clock back so that I could handle my first dog with the knowledge that I have now. My favourite thing... is seeing the sun shine and everybody out with there with their woofs, either walking or training but just enjoying. I don't like... this awful weather. My greatest wish is... to see my new little rescue achieve and enjoy his life. The last time...that I shall say retire as I am enjoying myself with my woofs. If I could... I will try and compete for a wee time yet. My advice is... keep having fun and more fun. Breed: NSDTR Age: 7 years My favourite... time of day is Summer evening when I can sit in the garden with all my dogs around me. I don't like... standing in agility queue next to a dog which continually barks while the handler makes no effort to stop it. My greatest wish... Is to take a balloon flight at dawn. 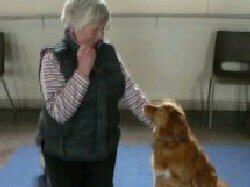 I remember... my first agility show with my Golden Retriever, Goldie. If I could... I would run a bit faster as it would help poor Breeze who does her own thing while I play catch up. My advice is... don't stop doing agility. Keep going and have fun.